Forest Gardening: mimicking the structure and function of forests in the way we garden, or using the forest as a model for the way we garden. Dave Jacke and others advocate that in Forest Gardening we want to mimic mid-succession forests and woodlands with a 40 – 50% canopy cover. It is here that many shrubs and herbaceous plants can thrive and many of our multi-functional species are adapted to this phase of growth. Forest Farming: the intentional cultivation of non-timber forest crops underneath the established canopy of an existing forest. This is gardening/farming IN the forest. Since we are working with later succession ecosystems, our palette of species is quite a bit more limited. Species need to be considerably more shade tolerant. We tend to focus more on things like mushrooms, and shade loving perennials that are already found in woodlands (ginseng, leeks, goldenseal, etc). And, in contrast to Dave’s strategy described above, Ken and I are actually advocating that forest landowners get into their woodlots and actively manage their forests for long-term health. We are convinced this activity is not only possible, but necessary, as so many forests have been degraded from poor and limited decision making in the past. Non-timber forest crops, like those covered in the practice of forest farming, are a potential incentive to support good forestry practices. Based on the above definitions, one basic distinction between Forest Farming and Forest Gardening might be the type of ecosystem we are starting with. Are we going from open field or semi-brushy field and thinking about taking this “blank slate” toward a forested system, or are we working with expanding the diversity and functionality of an existing forest? Our context provides a direction to employ the tools. In Permaculture we want to work with the system, rather than against it’s natural succession. Therefore it’s inappropriate to think about cutting down a forest, with its accumulated ecosystem wealth, in order to plant a garden (or field crops). Yet this happens all the time. When a culture values it’s forests for timber and firewood only, it’s somehow easy to justify clearing woods for food production. 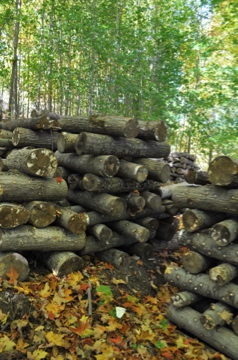 In Forest Farming systems we are often looking for farm scale, production systems. 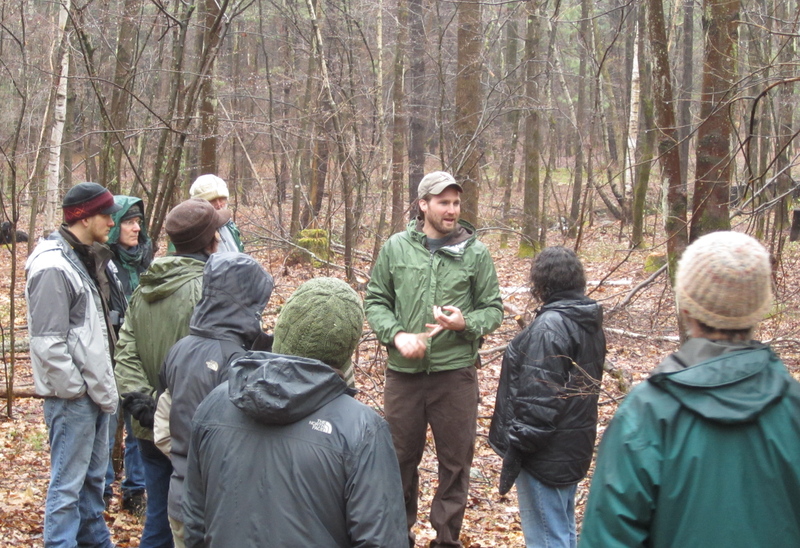 Forest Farming is very appropriate for hobby growers, but that our focus is often on systems that work in managed forests, with the implication that we are working in spaces larger than one’s own backyard. 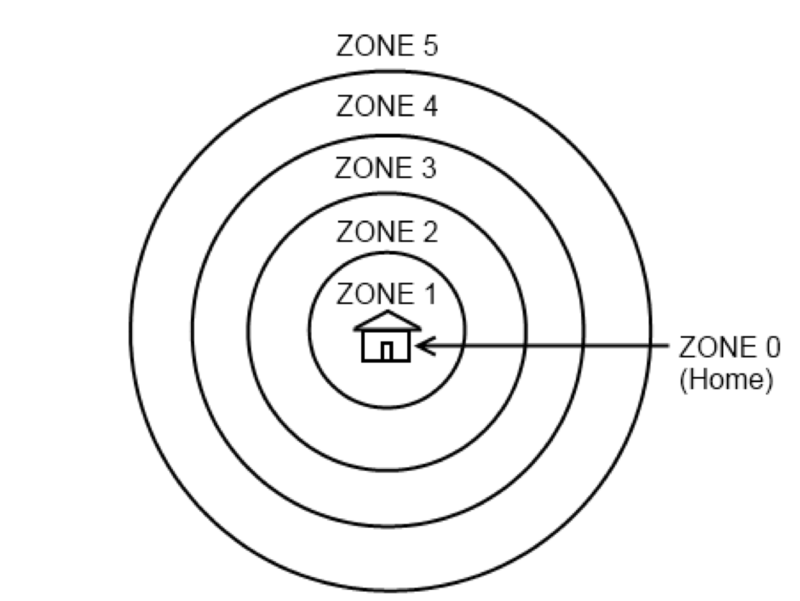 This is a rough guideline, as the specific context of a site ultimately determines the actual layout of zones. The borders between on and the next are not ridged, either. Some grazing animals may move between multiple zones, for example. Taking the zones principles in the context of our discussion, we might see that Forest Gardens, which tend to mix many different species in patches, might best be thought of as a Zone 1/Zone 2 tool. 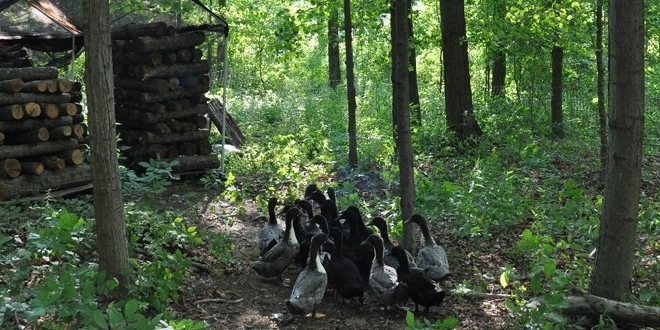 Zone 4, with it’s forest as the base ecosystem, implies the practice of Forest Farming. Zone 3, depending again on the context, is perhaps where the two practices meet. But then again, it can easily get a bit more complex. • Riparian Buffers: tree crop systems in waterways like steams, rivers, wetlands, etc. Ken and I have added Forest Gardening (developing patches of multiple species and layers, mimicking forest structure and function) to this list, though some agroforestry “experts” are not prepared to accept forest gardening as one of the basic agroforestry practices. In our upcoming book, we plan to continue the discussion on this topic, as each practice mentioned above tends to act as complement to the others. As mentioned in the beginning of this article, drawing distinctions between all these practices is tricky business. 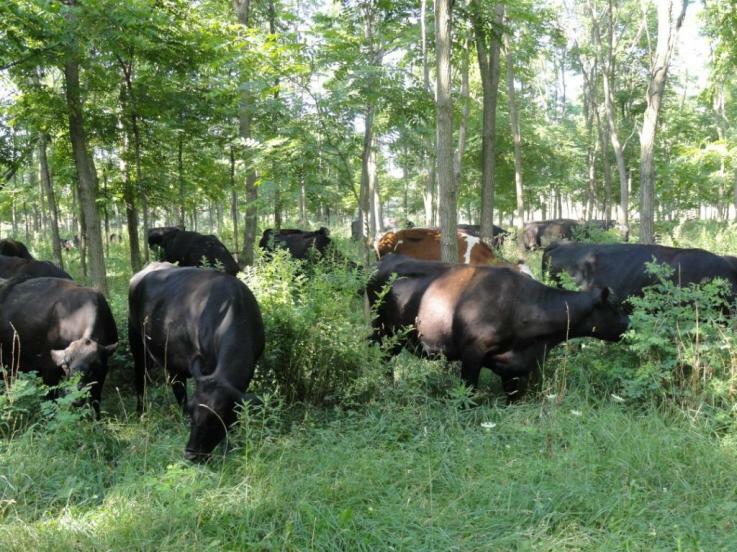 For example, when we regard silvopasture as “three-story agriculture”, as it is often called, we are limiting the potential to the management of trees, grasses, and grazing animals. Often, the forest needs to be thinned (or planted) at a wide spacing to allow adequate light to grow grasses. If this is the case, then were do foraging animals like ducks or goats fit in? If we are not growing grasses for foraging, are we still doing silvopasture? As Ken notes, “by my general nature I tend to be a lumper, not a splitter.” I agree. We are interested in this dialogue, but not to contain a practice in any one category. In fact, we seek just the opposite. Like a carpenter needs more than a hammer… we see these different agroforestry practices (forest gardening included) to be analogous to a well stocked toolbox of saws, pliers, hammers, etc. All these practices will combine to reforest our farm, while meeting our personal goals for hobby and commercial production. Whether managing existing forests, or building new ones, engaging the diverse array of agroforestry practices has helped our thinking and planning. Forest Farming, at least in the temperate climate, is perhaps the least articulated of all these practices, yet holds great potential. We see our book as a companion to Edible Forest Gardens, as well as publications like “Silvopasturing in the Northeast” by Brett Chedzoy and Peter Smallidge and others. As for the case studies we are fundraising for, we ARE specifically looking for current farmers and hobby woodlot owners who are cultivating crops under the canopy of an existing woods while engaging in forest management. This doesn’t mean we won’t visit a few other agroforestry examples, such as the Alley Cropping/Silvopasture practices of Mark Shephard’s New Forest Farm. While Mark didn’t start with an existing woodlot, we have much to learn from his trials and tribulations with tree crops. Our main interest is to further the understanding of tree-based agriculture, by whatever name. If Farming the Woods can strengthen that conversation, we will have done our job. This entry was tagged Agriculture, agroforestry, Broadacre, Dave Jacke, Forest, forest farming, Forest Gardening, Forest management, Forestry, Garden, Ken Mudge, Non-timber forest products, Permaculture, Silvopasture, Steve Gabriel, Tree Crops. Bookmark the permalink.